A classic dish for any party or get-together, our Seven Layer Salad is lightened up and delicious! 1. Stir together yogurt, sour cream and dressing mix. Chill while layering the rest of the ingredients. 1. Layer greens, meat, avocados, blue cheese and onions in a deep glass salad bowl or 9x13-inch glass baking dish. 1. Spread chilled dressing evenly over salad. 1. 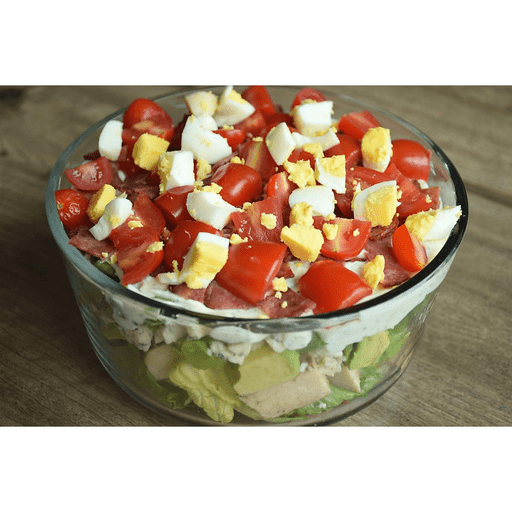 Decorate top of salad with bacon, eggs and tomatoes. 1. Chill 4 to 8 hours before serving. Use cooked ham or turkey instead of chicken or use a combination. Calories 140, Total Fat 9g (Saturated 2.5g, Trans 0g), Cholesterol 55mg, Sodium 480mg, Total Carbohydrate 6g (Dietary Fiber 3g, Sugars 1g), Protein 10g, Vitamin A 45%, Vitamin C 10%, Calcium 6%, Iron 4% *Nutritional values are an approximation. Actual nutritional values may vary due to preparation techniques, variations related to suppliers, regional and seasonal differences, or rounding.